The Story: I stocked up on sweet and deliciously un-local Ataulfo mangos from Mexico at the Trader Joe's last week. Laurel and I are eating them every which way. We snack on slices right off the cutting board in the afternoon. We mix mango cubes into Greek yogurt for dessert. And, we’re adding them to oats. 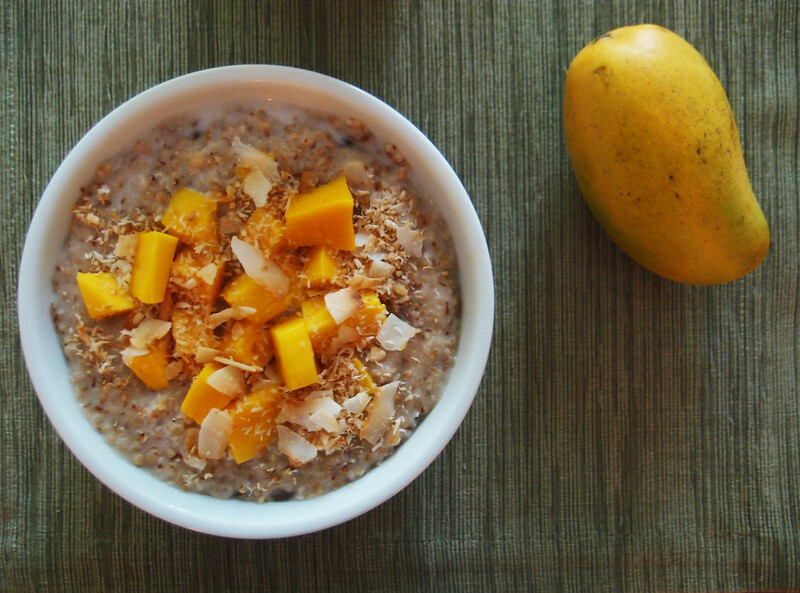 The Ataulfo is sweeter and less fibrous than regular mangos, so the buttery flesh sweetens oats enough that we skip our usually dollop of honey or maple syrup. The coconut milk makes the oats rich and creamy. The Instructions: Follow the directions on the McCann’s steel-cut oats can: “Into four cups of briskly boiling water sprinkle one cup of oatmeal, stirring well. When the porridge is smooth and beginning to thicken, reduce heat and simmer uncovered for 30 minutes, stirring occasionally.” Stir 1/4 cup of coconut milk and a handful of chopped walnuts into the oats about 10 minutes before the oats finish cooking (when the oats have softened but still have a mildly unpleasant chew). Top with chopped mango and toasted coconut.